How many times did it happen to you? to all of us? You are STUCK! You want to create but all your inspiration has gone out the window. You started a project and you don't know how to move on and finish it. You're tired of always using the same materials and techniques. You want to try something new but don't know where or how to begin. You have a deadline but can't jump start your muse. You are not alone! It has happened to all of us, more than once...more than twice...more than many times! Well...I think I might have a solution. I call it Creativity Inspired. it's a series of tips/sentences/ideas/calls for action and more that will unstuck you and help your creativity flow! I will share them with you periodically in the hopes of helping you...and me...when we most need it. Obvious? maybe, but that's not all. The leaving part is kind of obvious. go away and come back with a fresh look on things. But there is another part for this tip...what is the something else? First option, do something else creative like cooking. 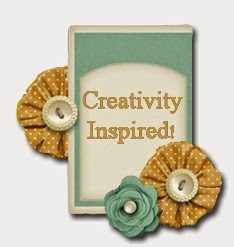 That trigers the creative part of your brain from another "angle" and might help with your crafters' block. The second option. is to do something repetative like folding laundry. Something that doesn't require any thought just action. This will calm your creative thought process and while it rests, much like just before you fall asleep, ideas start to flow. Both options can help. You have to find out what option works best for you and when. It might be one or the other, or even a combination of the two. Collect your Creativity Inspired tips and insights so you can build a pool of advice to boost your creativity when in need!